International Advisory Council （IAC）is a small and high-level group comprising highly respected and experienced personalities from various domains with wide international outreach and influence and, above all, a strong commitment to the objectives of the ecological civilisation and to expanding of Eco Forum Global (EFG)’ impact. IAC serves as an advisory group for developing strategies and providing for EFG on issues defining the scope of the forum’s substantive focus and activities, advancing and promoting the concept and practices of eco-civilization at global level. 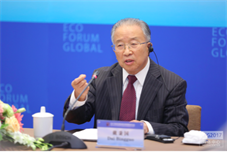 To define the EFG development strategy and path, consider how to build the EFG into a bridge linking China's construction of an ecological civilization with the 2030 Agenda for Sustainable Development and the Paris Agreement, and work to connect with some important international treaty organizations, so as to join hands with them in the construction of ecological civilizations. To consider how to formulate keynote topics for the EFG's development, and identify an EFG development strategy for the next three to five years. To consider how to highlight the EFG's features of "taking root in Guizhou, serving the country, going global, and being geared to the future", and build the EFG into a world-famous brand and platform, so as to exert the EFG's unique advantages to the largest extent. Consider how to involve more enterprises, cities and towns in the EFG. Consider how to implement the policy of "enterprises as the main actors, cities and towns as the carriers", focus on the major difficulties and key issues in the green transformation of enterprises and the green development of cities and towns to put forward best solutions, so as to make enterprises more appealing to local governments and cities and towns. Consider how to attract famous multinational companies and state-owned enterprises to participate in the EFG as "bellwethers". Consider how to seize famous cities and towns for ecological civilization and green development, and related protected areas. Consider how to select famous state-owned enterprises, as well as outstanding representatives of private enterprises and companies from Hong Kong, Macao and Taiwan, and attract outstanding representatives of green enterprises and green cities and towns to participate in the EFG. To study how to integrate the ecological civilization construction and the global sustainable development with the combat against climate change. As the EFG's top-level design and think tank building, study how to make the Ecological Civilization Pilot Zone lead China's construction of an ecological civilization; as an effort of think tank building, work with the first working group to discuss the establishment of high-standard research topics and disciplines, and to better serve the construction of the Ecological Civilization Pilot Zone. Study how the EFG can connect the construction of an ecological civilization with the policies and planned projects of the state ministries and commissions. For example, the group can carry out research into the concepts of "lucid waters and green mountains are invaluable assets", the construction of an ecological civilization, and the implementation of the Belt and Road Initiative. Taking the ecological civilization construction as a platform and a bridge, consider implementing some ecological projects to serve other provinces (municipalities, autonomous regions), especially the underdeveloped ones, and identify these projects as the EFG's priorities for the next year. Consider how to combine the EFG with China's ecosystem protection and restoration plans and projects, including the construction of wetlands, waters and rivers, national parks and coastlines. Consider how to build green economy and green development into the EFG's core topics, how to make policy proposals in the fields of green economy, ecological industries, green finance etc. to promote the implementation of relevant projects. Consider how to unify green economies with new economies, including making policy recommendations for the development of artificial intelligence, big data, shared economy, as well as other new economies and green economies, and striving to bridge up green economies and the battle against poverty. Mobilize all of the EFG partners to raise funds and other resources, instill creativity and vitality in the EFG, create a virtuous circle for the EFG itself, and enhance the EFG's fund-raising ability for ecological civilization construction. Give priority to developing the eco-industrial projects that involve green economies in the EFG every year, and the corporate projects that stand out through the sharing of best practices, and introduce them to the companies attending the EFG to facilitate mutual exchange between local governments and enterprises.